This year we saw a huge jump in nominations to the Allianz Business to Arts Awards, with a 25% increase on previous record levels. Nominations came from all over the country, from organisations of all sizes, sectors and scopes. The nominations celebrated outstanding relationships and partnerships right across the artforms, and featured diverse engagement programmes for communities, staff and education. The winners will be announced at the 24th annual Allianz Business to Arts Awards in the Bord Gáis Theatre on Tuesday 1 September 2015 by Minister for Arts, Heritage & the Gaeltacht, Heather Humphreys TD. The winners will receive a sculpture entitled ‘Corballis’ by Michelle Byrne, commissioned by daa. 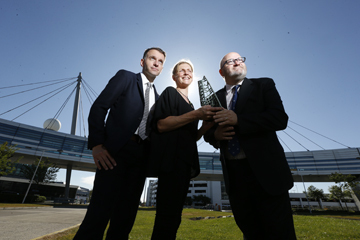 Carlow sculptor Michelle Byrne with Andrew Hetherington, Business to Arts and Paul O’Kane, daa. Partnerships between businesses and the arts take many shapes and forms. While many fall under the public radar, there are some partnerships that are highly visible, unexpected and engaging. A spectrum of activities with artists, craft makers and designers are revitalising brands, connecting to core consumers and driving associations with the arts. We love the projects developed by the following retailers, and how their activities are shining new light on active engagement between the business and cultural sectors. An unlikely pairing took place last year between Brown Thomas – synonymous with luxury and beauty – and Dublin graffiti artist Maser. The collaboration included a limited-edition shopping bag, and an installation piece for the retailer’s shop windows on Grafton Street, which saw a mix of bold colours and patterns inspired by the fashion shows of Spring/Summer 2014. As a show-stopping, eye-candy window display for pedestrians and customers, Brown Thomas gave insight into the meeting point between fashion, art and effective branding. Since 2010, Brown Thomas has celebrated Irish innovation and design through its in-store event, CREATE. Local makers and designers across craft, fashion and textiles display their work throughout Brown Thomas’ Dublin store and in pop-up shops in Cork, Galway and Limerick. Shoppers can attend in-store demonstrations and opportunities to meet designers and makers, driving interest in Irish design. TileStyle has a long standing tradition of supporting the arts and showcasing artwork in its retail space. A passion for the arts is part of its brand, clearly evident every time customers step into their showroom in Ballmount with changing art exhibitions happening regularly. 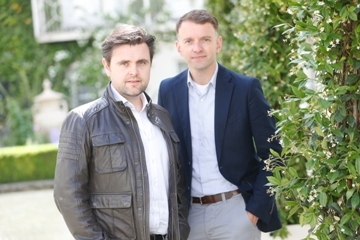 Recently they have partnered with NCAD in a ‘Knowledge Transfer Programme’. TileStyle staff engage closely with NCAD Ceramics students to produce new artworks that innovatively work with ceramics. TileStyle’s continuous contribution to the arts shows a unique personality and complements its retail offering by revealing their commitment to supporting future generations of creativity. As champions of designers and makers, Arnotts has been promoting Irish creativity since 2013 with their initiative ‘Love Irish Design’. Favouring local economic growth, there is a recent consumer trend towards buying locally produced products within the gifting and tourism markets. Supporting emerging and established Irish designers throughout their stores in clothing, jewellery, homewares and accessories, Arnotts is a retail store you don’t want to miss to stay on trend with the best in Irish design. The Crescent Shopping Centre (Clancourt Group) was a major sponsor in 2014 of Limerick City of Culture. 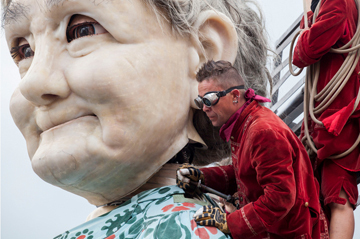 Their sponsorship included the presentation of the world-renowned street theatre company Royal de Luxe and their staging throughout the city during a 3-day period of ‘The Giant’s Journey’. Their brand was associated with a remarkable event in the city, seen by 230,000 visitors. Keen on contributing to Limerick’s cultural development, Crescent Shopping Centre have partnered up once again with the city and Limerick’s bid for Capital of Culture 2020. As part of ongoing activities in the city, they will host a popup culture shop within the shopping centre for all to enjoy. Gerard McNaughton (L) elected as Chairman of Business to Arts with Andrew Hetherington, Chief Executive. Photograph by Robbie Reynolds. We’re delighted to announce that Gerard McNaughton, Retail Director of TileStyle, has been elected incoming Chairman of our Board of Directors. 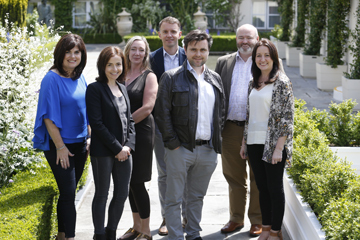 Gerard takes over from Michael Owens, HR Director of Vhi Healthcare, who has Chaired the organisation since 2011. Michael remains on the Board. Gerard joined the Board of Business to Arts in 2009, and became Vice Chairman in 2011. TileStyle and the McNaughton Family have been stalwart supporters of Business to Arts since 1991, as Patrons and past title Sponsors and current category sponsors of our annual Awards programme. TileStyle have also been represented on the Board for many years. Gerard’s Father, Jim McNaughton was Chairman of Business to Arts from 2001-2003, and is remembered each year through the naming of two categories in the Allianz Business to Arts Awards celebrating commissioning and emerging artistic practice.